Walker Rocks will soon be hitting the road. 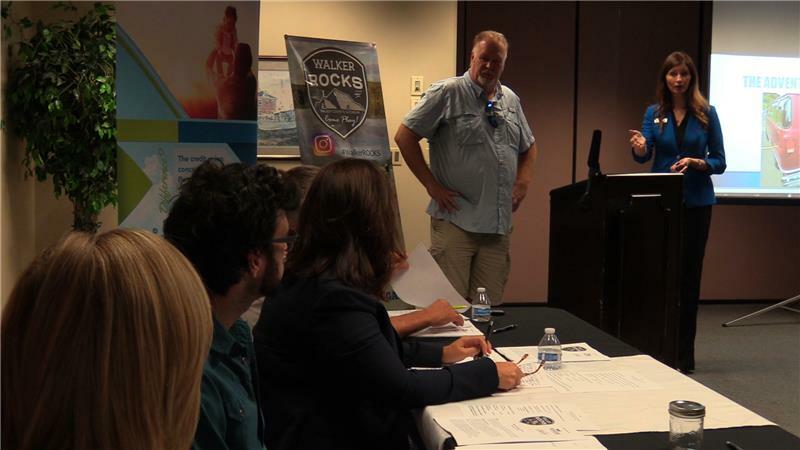 David Bridges, owner of Battlefield Outdoors, won a $5,000 grant at the first ever Walker Rocks Start-up Challenge pitch competition. Mr. Bridges competed against two other finalists, selected from a pool of applicants. Mr. Bridges pitched the idea of adding a passenger van to his business to transport outdoor enthusiasts to hiking, biking and kayaking destinations in Walker County and other parts of the southeast. The van will be wrapped with the Walker Rocks logo, along with artwork featuring Walker County based attractions. "It's a way for people to find out about us and to get interest in an area that we know is so great," said Mr. Bridges. "There are so many things that would lend to people wanting to come here." Walker Rocks highlights the scenic and stunning destinations available in Walker County for rock climbing, caving, kayaking, hiking, biking and other outdoor adventures. The new tourism initiative embraces the county's environmental assets and invites outdoor enthusiasts to come play.